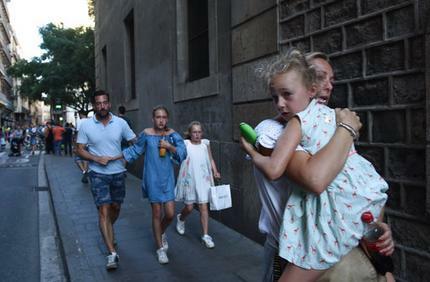 BARCELONA, Spain (AP) — A white van jumped up onto a sidewalk and sped down a pedestrian zone Thursday in Barcelona’s historic Las Ramblas district, swerving from side to side as it plowed into tourists and residents. Authorities said 12 people were killed and 80 were wounded, 15 of them seriously, in what they called a terror attack. The president of Spain’s Catalonia region, Carles Puigdemont, provided the updated casualty figures, correcting an earlier government tweet that said 13 people were killed. 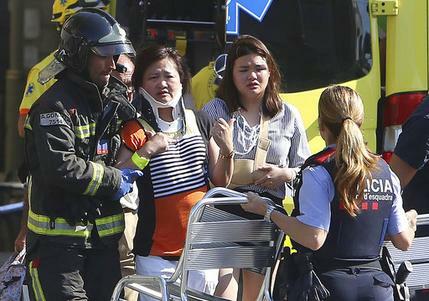 The afternoon attack in the northeastern Spanish city was the country’s deadliest since 2004, when al-Qaida-inspired bombers killed 192 people in coordinated attacks on Madrid’s commuter trains. It left victims sprawled out in the street, spattered with blood or crippled by broken limbs. Others fled in panic, screaming or carrying young children in their arms. As witnesses and emergency workers tried to help the wounded, police brandishing hand guns launched a search of side streets looking for suspects. Police immediately cordoned off the city’s broad avenue and ordered stores and nearby Metro and train stations to close. They asked people to stay away from the area so as not to get in the way of emergency services. A helicopter hovered over the scene. A few hours later, Catalan police tweeted: “We have arrested one man and we are treating him as a terrorist.” They said no suspects were holed up in a Barcelona bar, as local media had reported, and began to evacuate stores on the sprawling avenue where scores of people had taken cover. State-owned broadcaster RTVE reported that investigators think two vans were used – one for the attack and a second as a getaway vehicle. Las Ramblas, a street of stalls and shops that cuts through the center of Barcelona, is one of the city’s top tourist destinations. People walk down a wide, pedestrian path in the center of the street while cars can travel on either side.